Peanut butter and jam may have been a staple in your lunch box as a kid—and that’s a good thing! Peanut butter (the kind without added palm oil and icing sugar) is a good source of nutrients that can keep you going all through a busy day. First and foremost, peanut butter is an excellent source of vegetarian protein: two tablespoons of peanut butter will net you about seven grams of protein. 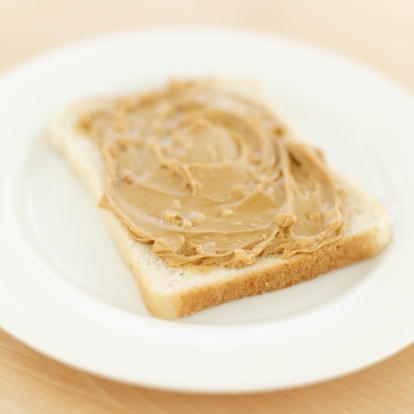 Eating peanut butter for breakfast or lunch will keep you feeling full, helping to avoid the temptation to snack all day long. The protein in peanut butter is also used by your body to build and repair muscle. Peanut butter is considered a heart-friendly food. Although peanut butter does contain some saturated fat, it also has a high percentage of unsaturated fat which is deemed to be heart-healthy. The unsaturated fat in peanut butter can give you a source of energy to carry you through your day. Peanut butter is high in potassium, which can help to neutralize the effects of a diet high in sodium. Peanut butter contains a significant amount of fiber, which is beneficial in helping to keep blood sugar levels balanced. Other special ingredients in this delicious spread include vitamin E, magnesium, and vitamin B6. Peanut butter’s nutritional profile just got another boost. A recent clinical trial conducted by researchers from the Siteman Cancer Center at Barnes-Jewish Hospital and Washington University School of Medicine, in St. Louis, suggests that eating peanut butter or nuts may lower the risk for a benign form of breast cancer. Benign breast disease is characterized by changes in breast tissue that are non-cancerous. However, the condition is thought to lead to breast cancer in many instances, so it still poses a very real threat. For their study, the research team analyzed data from over 9,000 women. They had followed the women for 14 years, beginning in 1996, when the participants were nine to 15 years old, and ending in 2010. After looking at all the amassed data, the researchers discovered that women who ate peanut butter or nuts three times per week reduced their risk for getting benign breast disease by an astonishing 39%. The researchers say, if nothing else, this study shows that there are untapped resources out there that could help in the prevention of breast cancer. While not everyone is going to be able to eat peanut butter from a young age (many schools and other institutions have banned peanut butter due the number of anaphylactic allergies to the food), researchers may be able to track down what’s inside peanut butter that offers this tremendous protection against benign breast disease. Once the compounds are isolated, researchers could determine if these compounds are just as effective on their own. For now, the researchers think it’s the peanut’s protein that gives peanut butter it’s anti-cancer properties. Benign breast disease is very common in younger women, showing up in one out of every four who have yet to reach menopause. Having benign breast disease could increase the risk for invasive cancer almost threefold. “Can Eating Peanut Butter Cut Breast Cancer Risk in Later Life?” MedlinePlus web site, Sept. 27, 2013; http://m.medlineplus.gov/news/fullstory_141075.htm, last accessed Oct. 17, 2013. Berkey, C.S., et al., “Vegetable protein and vegetable fat intakes in pre-adolescent and adolescent girls, and risk for benign breast disease in young women,” Breast Cancer Res Treat. September 2013; 141(2): 299-306.